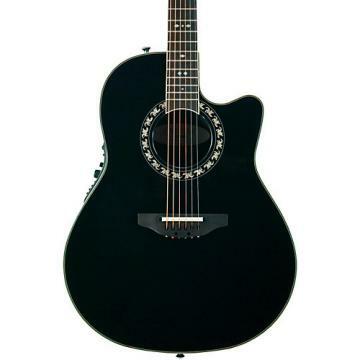 The Ovation 1678AV50-5 50th Anniversary Custom Elite Shallow Acoustic-Electric Guitar is a limited series instrument that celebrates Ovation's 50 years of innovation and excellence in guitar construction. It features exquisite craftsmanship made in America including a mid contour body design with an AAA Bearclaw spruce top. The back has a hand-laid Lyrachord contour and the neck is 2-piece curly maple with an ebony fingerboard. Refinements include gold Schaller tuners, black ABS body binging with gold purfling and a special 50th anniversary inlay at the 12th fret. This guitar is ready to take the stage with Ovation's high-end OP Pro Studio preamp and pickup package. Includes hardshell case. Celebrate your love for innovation and unique style. Order this special Ovation today.